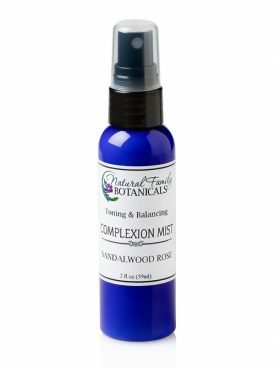 Rich in anti-oxidants and essential oils to bring beauty and wholesomeness to your skin. Use daily to keep skin looking healthy, radiant, and fresh. 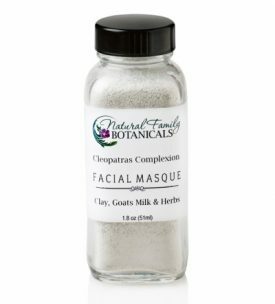 Daily Facial Moisturizer is a deep hydrating facial lotion with organic and natural ingredients that absorb quickly to keep your face supple and moist and your complexion smooth while protecting it from the elements. Enhanced with anti-oxidant rich organic ingredients such as green tea, sunflower, and non-gmo vitamin E that naturally delay the skins aging process by fighting skin damaging effects caused by the sun and pollution. This moisturizing lotion also contains olive squalane, a must for countering the effects of aging. This amazing oil boosts cell regeneration, oxygenates our skin cells, helps prevent age spots and UV damage, reduces the appearance of wrinkles, and helps skin retain moisture! Regular daily use of our Daily Facial Moisturizer is sure to bring visible and positive results. 6 oz. pump top recyclable bottle. Distilled water, certified organic sunflower oil, certified organic aloe vera juice, organic rosehip seed oil, shea butter, olive squalane oil, vegetable emulsifying wax, palm stearic, tapioca starch, non-gmo vitamin e oil, organic green tea extract, organic rosemary extract, leuconostoc/radish root ferment filtrate (natural preservative), organic lavender essential oil, neroli essential oil, rose absolute, sandalwood essential oil, silk protein, non-gmo citric acid (derived from fruit, corn-free). 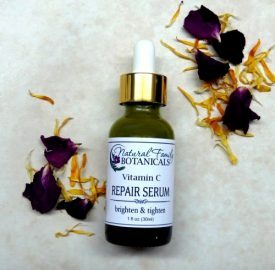 Rosehip seed oil – A natural source of Retinol A that has been scientifically proven to eliminate surface wrinkles, fade age spots, regenerate damaged skin, and soften and reduce the appearance of scars and stretch marks. Olive squalane – Improves skin cell regeneration, oxygenates our skin cells, helps prevent age spots, prevent and reverse UV damage, reduces the appearance of wrinkles, and helps skin retain moisture. Lavender essential oil – Soothes inflamed skin, reduce redness and blotchiness of complexion, increases blood flow and oxygenation of tissues, plus antiseptic and antifungal qualities for healthy skin. Neroli essential oil – Healing to mature and sensitive skin. Balances and smooths complexion and reduces wrinkles. Sandalwood essential oil – A powerful antioxidant that hinders wrinkle-causing free radicals, helps remove toxins, acne, soothe inflammation, improves blood circulation to your face, and reverse sun damage. .
(CLICK HERE for amazing information on these ingredients). Apply daily to entire face and neck for maximum benefits and to keep skin moist and protected from the elements. Once a day should be sufficient but use more if your skin needs it. I absolutely love this moisturizer. I have a hard time using any products on my face without breaking out with either acne or hives. 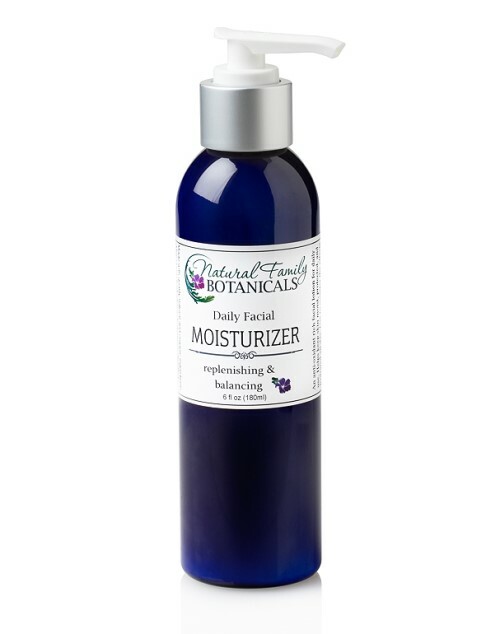 I started using Natural Family Botanicals products especially this moisturizer a few years back. This is my morning moisturizer I use after washing my face with the facial cleanser. It always feels so good to put this moisturizer on my face. It’s so lightweight and not greasy. I love it. It keeps my skin happy, clear and healthy! I have been using this lotion for some months now and I will say adamantly it is worlds better than any other I have tried! Feels light and silky to put on (you don’t need much) and the fragrance is subtle -and lovely. (Am very fussy when it comes to fragrances) I think my skin has noticeably improved in terms of tone and age-related pigment changes. It’s a superior product, clearly made of fine nutrient-rich ingredients. I use this lotion every morning after getting out of the shower. It is the perfect moisturizer because it has a rich consistency, but goes on light. I apply it and let it set for a few minutes and by the time I’m ready to put on my makeup, it’s all been absorbed. It has a nice fresh and light smell. Best everyday moisturizer I’ve ever used! I have used this product for years and I love it! I use it daily after my face washing routine with your other products. It makes my face feel smooth, my skin feel and look younger and it makes my make up easier to apply. Love how my skin feels after I put this on. I never go without it. This daily cream is wonderful!! I apply it over rose hip seed oil for my dry skin. It’s sinks in nicely no greasiness at all. I have sensitive skin and get peri-oral dermatitis with some products,but never with NF Botanicals!! Daily Facial Moisturizer is wonderful !! Not heavy or greasy and a small amount is sufficient to use on your whole face and neck. It absorbs very well and I can see a difference in the appearance of my skin after I apply it. The organic ingredients are so awesome in this age of pesticides, gmo’s and all manner of nasty chemicals. Love this moisturizer! 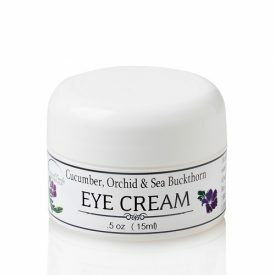 I use it daily, doesn’t cause clogged pores, goes on light, and doesn’t make my eyes itch. It’s the only facial moisturizer I will use. Love the all natural ingredients and it keeps my skin looking healthy.